We knew it was out there somewhere. We had seen pictures of it, it was on our chart and there was a yellow dot on our radar. We just needed to see it with our own eyes. But nothing appeared in the fog. 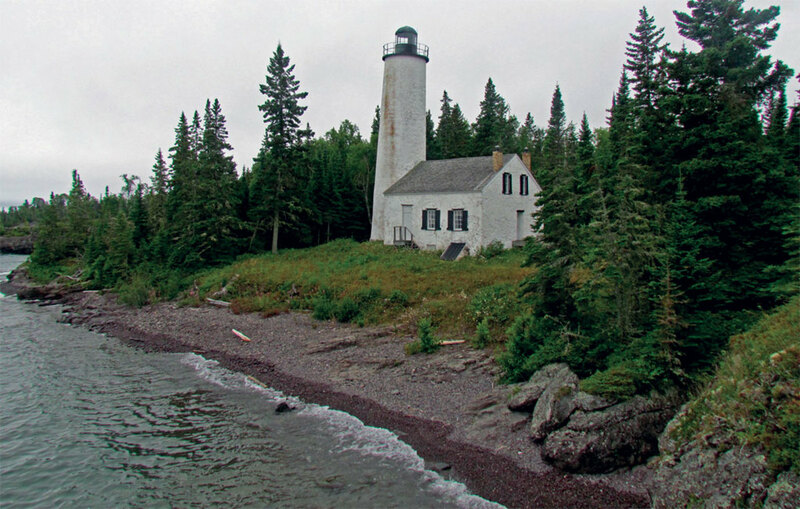 The “it” was Rock of Ages lighthouse, the 130ft tower that marks the western entrance to Isle Royale on Lake Superior. The tower sits in the middle of a minefield of shoals that over the years have claimed at least three lake freighters, some of which still have crewmembers inside. 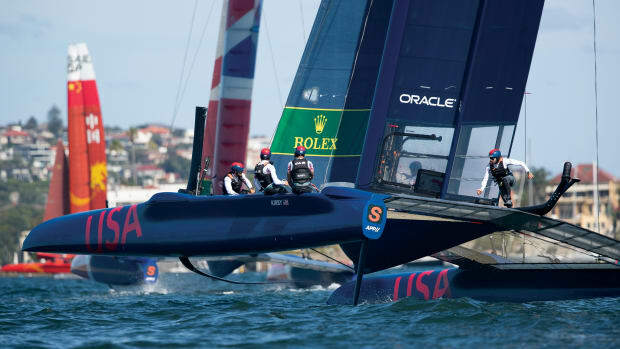 The seas were big, the wind was contrary and we were tired—we did not want to join them. Finally, my wife, Jennifer, gave a shout. There, a half mile to starboard, right where it should be, we saw a shape separate itself from the pall of fog. Slowly the top 50ft of a gleaming white tower emerged under the wan afternoon sun. We were going to get safely to Isle Royale after all. At 52 miles long and eight miles wide, Isle Royale is the largest island in the largest freshwater lake in the world. A billion years ago, a rift in the earth’s crust under what is now Lake Superior allowed mineral-rich, molten magma to reach the surface. More recently a million years of glacial scouring exposed seams of almost pure copper. 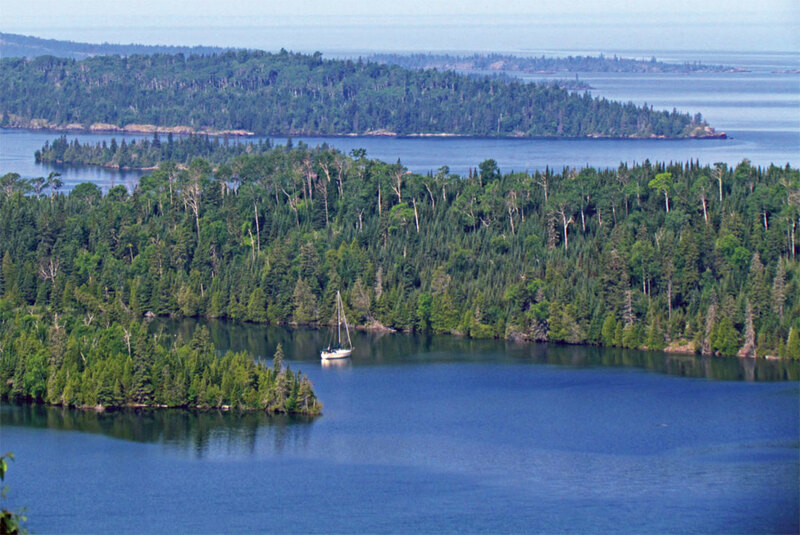 For millennia, Native Americans paddled across Superior’s waters to wrench the copper from the earth, so that Isle Royale copper became a valuable trade item in prehistoric times, and has been found in jewelry as far south as Central America. When England and the youthful United States resolved their differences in 1783’s treaty of Versailles, they settled border issues in the largely unexplored northern wilderness with a lot of guesswork. British maps of the era suggested there were four very large islands in Lake Superior. With that in mind, wily old Ben Franklin, who represented America in the negotiations and had heard reports of the copper-rich island, generously suggested that England take three of the islands and America take only Isle Royale. England agreed, only to find out 50 years later that one of its three islands didn’t exist and that Isle Royale was hard on the lake’s northern shore. 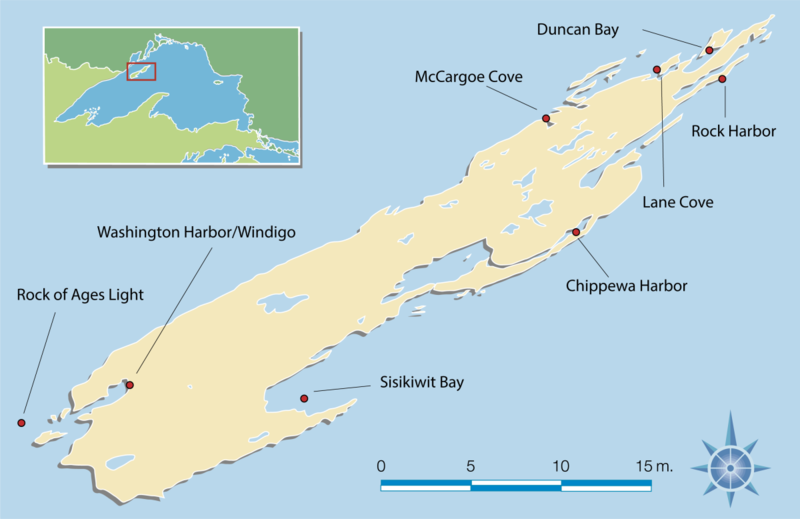 Isle Royale stands just 15 miles from Canada and 50 miles from Michigan. Miners came to the island in the 1840s, followed by fishermen, loggers, and finally tourists, seeking clean air and relief from summer heat. 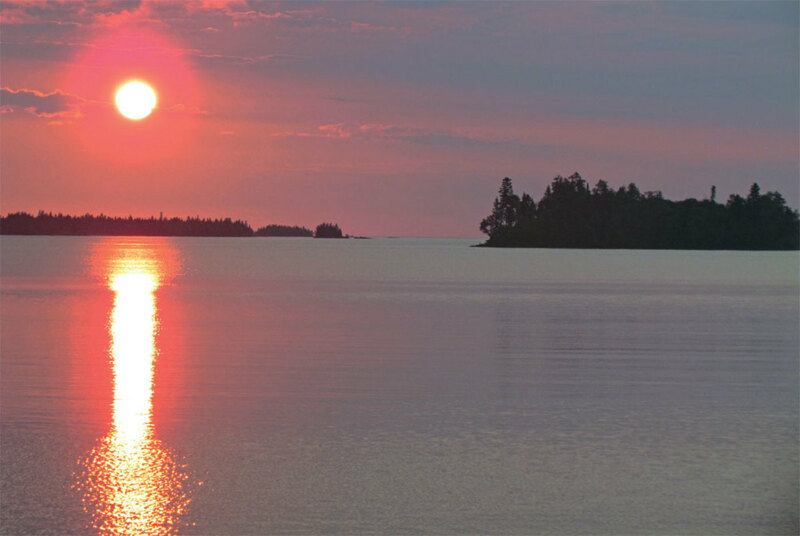 Isle Royale was designated a National Park in 1940­ and today over 90 percent of the island is federally designated wilderness, making the island the largest wilderness cruising ground in the continental United States. It was also named a United Nations Biosphere Reserve in 1981.  Jennifer and I spend our summers cruising Lake Superior on Catamount, our Caliber 38, and had come came to Isle Royale to circumnavigate the island, check out its many anchorages and do some hiking. 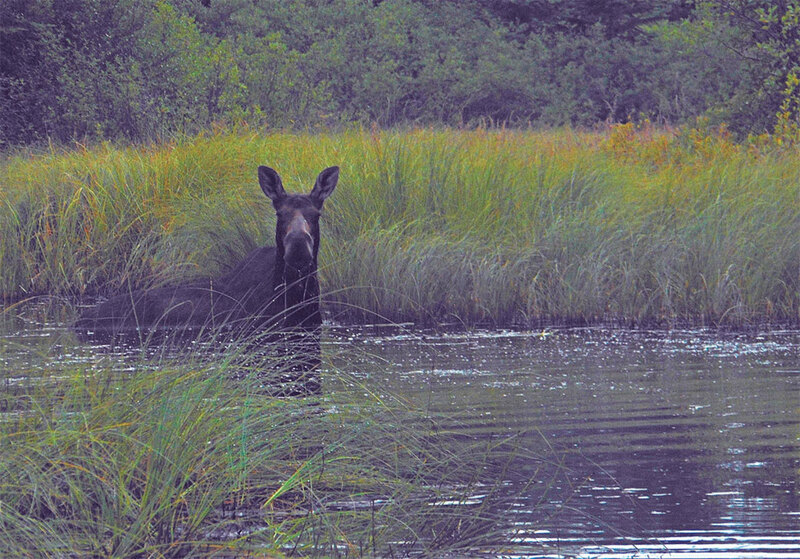 We also wanted very much to see at least one of the island’s many moose. Old family friends Rolf and Candy Peterson have spent their entire academic careers here studying the predator/prey relationship between the island’s moose, which swam over from Canada about 1900, and wolves, which came over on a winter ice bridge from the mainland in 1947. For decades wolves thrived on Isle Royale (lots of moose to eat in the winter, lots of beaver to eat the rest of the year) and there were about 50 wolves in the 1980s to help keep the moose population in check. Then came a combination of inbreeding and a canine parvovirus that started killing them off (hence the current ban on dogs coming to the island). Today the wolf population is in the single digits and a contentious debate rages about the wisdom of introducing more wolves from the mainland. Basically the Petersons are for it, and the Park Service is against it. Rolf and Candy said we would not see a wolf (they are just too canny) but guaranteed an encounter with one of the thousand or so moose. After finally finding Rock of Ages light, the fog lifted as we sailed down the two-mile-long entrance to Washington Harbor. 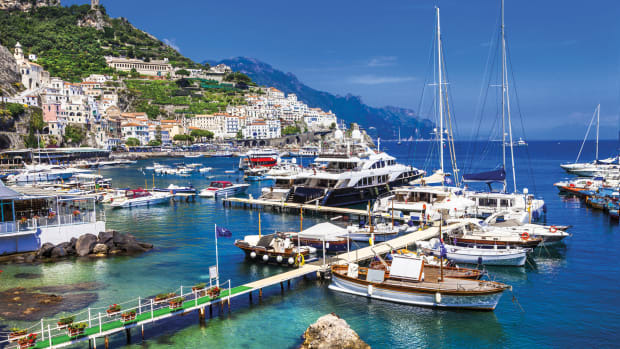 Steep wooded hillsides ended in a rock-bound shoreline reminiscent of Norway’s famous fjords. It was the first of many long, skinny, parallel harbors we would explore, all the result of that glacial scouring. At the end of the harbor was a totally protected anchorage behind Beaver Island, with 15ft of water over a mud bottom. The next day we registered at the Windigo ranger station where resident rangers go over the regulations, collect fees and staff a charming visitor center. 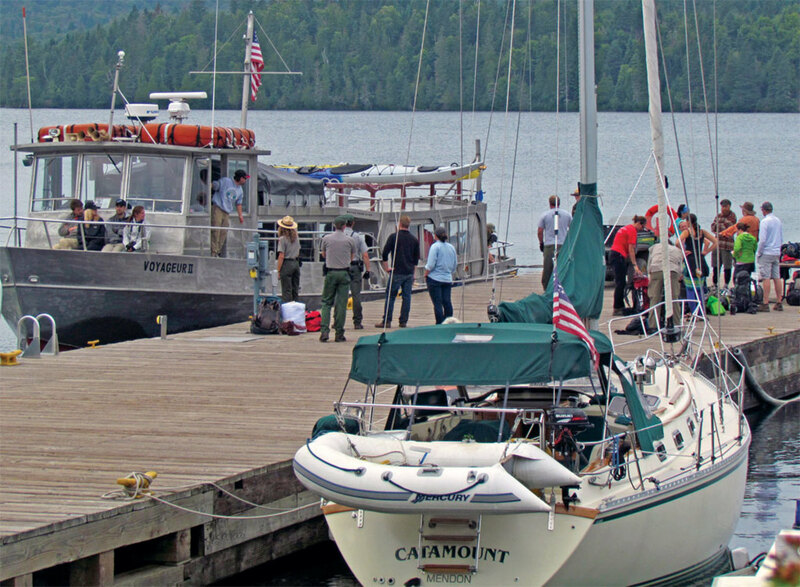 The ranger station dock also serves as the ferry dock for a thrice-weekly boat that comes up from Grand Portage, Minnesota, to drop off hikers, kayakers and other day-trippers. There are several well-maintained hiking trails that start at Windigo, part of a system of over 160 miles of trails on the island. We did a 10-mile loop that crossed rocky ridges, tumbling rapids and cranberry bogs. The trail kissed the northern shore of the island affording brilliant views over toward Canada as a rolling surf pounded the shoreline. We talked with hikers who had seen a bull moose moments before, but by the time we arrived there were only tracks. 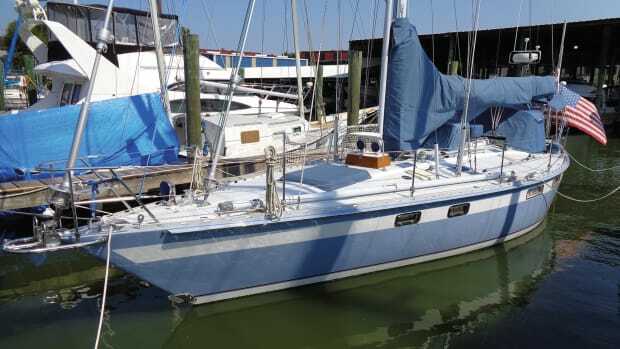 After that, having just spent two nights on the hook, we lay on the sturdy Windigo dock for the night as a series of rollicking electrical storms rolled through. With no harbors for about 25 miles, the island’s north shore is not a friendly one for sailors until you get to the far northeast end. In fact, just north of the entrance to Washington Harbor lies the 1928 wreck of the steamer America, its bow a couple of feet underwater but its stern canted downward to rest 80ft below the surface. Fortunately, there were no fatalities in this wreck. Farther along the north shore is the Kamloops, which rests in 200ft of water after foundering in a 1927 December gale. 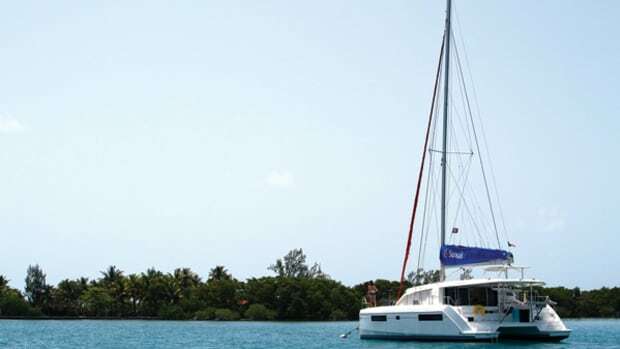 Sadly, all 22 passengers and crew were lost. Sailing along the north shore we eventually found McCargoe Cove, where we worked our way past red and green marks and settled into a small bight with good protection. A two-mile hike then took us to some prehistoric copper pits as well as the Minong Mine, where old railroad tracks and stone foundations testify to the thriving mining community that existed there in the late 1800s. Moose? Nope. 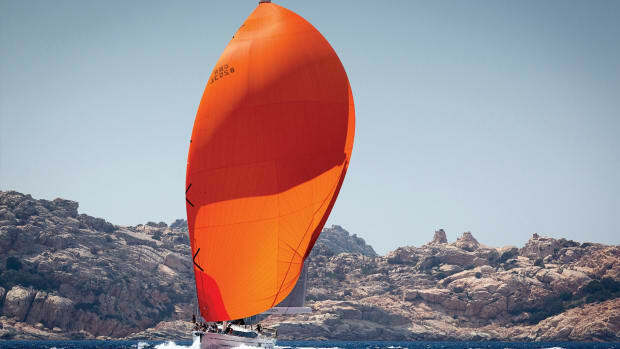 After that we caught a warm southwest breeze to sail wing and wing up Amygdaloid Channel, where we worked our way into little Lane Cove with its four-sided protection, sand bottom and a marsh in the distance. Moose like marshes, but we had to settle for a family of four loons: the chicks catching rides on their parents’ backs while the adults greeted us with their tremolo calls. Lane Cove is also a good starting point for a hike to Mount Franklin, named after Ben, with expansive views to the north. Along the way we plucked thimbleberries, blue berries and raspberries. We also saw lots of moose sign, but still no live sightings. Back out on the water, Lake Superior’s fog caught up with us again as we turned toward the northeast end of the island. Radar on and radar reflector up, we sailed at a crawl around Blake Point and then eased past several barrier islands to Rock Harbor and the protection of the dock at Caribou Island. It was time to hunker down and turn on the furnace. When the sun finally returned we hiked to the fire tower on Mount Ojibway for its 360-degree views of the island and the lake. The trail passed over rocky meadows festooned with lilies, asters, columbine and primrose, through pine forests with lady slippers and Canada dogwood, and around bogs filled with blue iris. Near the summit we found a moose antler, but where were the moose? Farther along the south shore we roared into Siskiwit Bay, nearly rail down in a strong southerly, doused the jib and main, and motored into a small corner of the bay to drop the hook. Jennifer was scanning the marsh nearby with the binoculars when one of the brown hummocks there suddenly raised its head. Water sluiced from the antlers of a bull moose as he calmly chewed on lily pads. We stood there transfixed until dark, distracted only by an eagle soaring overhead. Still, that particular moose was a good 200 yards away. We’d hoping for better. Our circumnavigation complete, we sailed back around to Isle Royale’s northeast end and worked our way into a corner of Duncan Bay. It’s one of the island’s all-weather anchorages, and we had it to ourselves. There we hiked to Lookout Louise where we could look down on Catamount at anchor two miles distant. One evening at dusk we paddled our dinghy up a stream at the head of the bay. It was quiet, the water flat, the light fading. Then it happened. Alerted by a pair of mallards that had erupted into flight nearby, the moose slowly raised her head out of the water and looked around, trying to make sense of what was going on. Notoriously dim sighted but with very good hearing, her ears sprang straight up as she looked directly at our approaching dinghy, just 10 feet away. Immediately, she lurched out of the water, sloshed up the bank on the left side of the stream and silently disappeared in the willows. Moments later, though, a muted bellow from the woods on the right side of the stream brought her back out into the open. She stood there for a moment, considering her options. Hmmm. I’m on this bank, my calf is on the other bank, and there’s this white thing in the water between us. Fortunately for all involved, the white thing beat a hasty retreat, the moose rejoined her calf on the right bank and the placid scene in the stream reverted to silence. 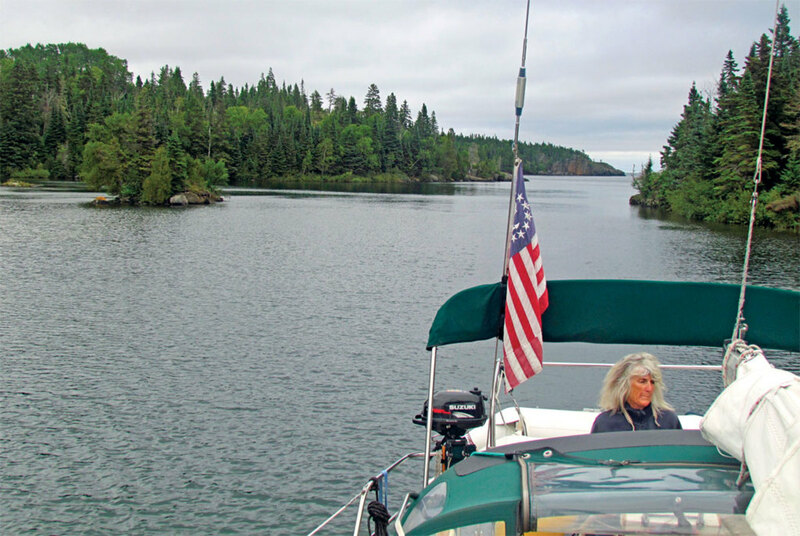 Our Isle Royale visit was now complete, and as we sailed east and the island’s profile fell off the horizon, we decided it isn’t just some of the best wilderness cruising in the continental United States: it may be one of the best cruising grounds anywhere. We had good sailing in both fog and sunshine, a choice of many secure anchorages and hiking through meadows of wild flowers to great vistas. 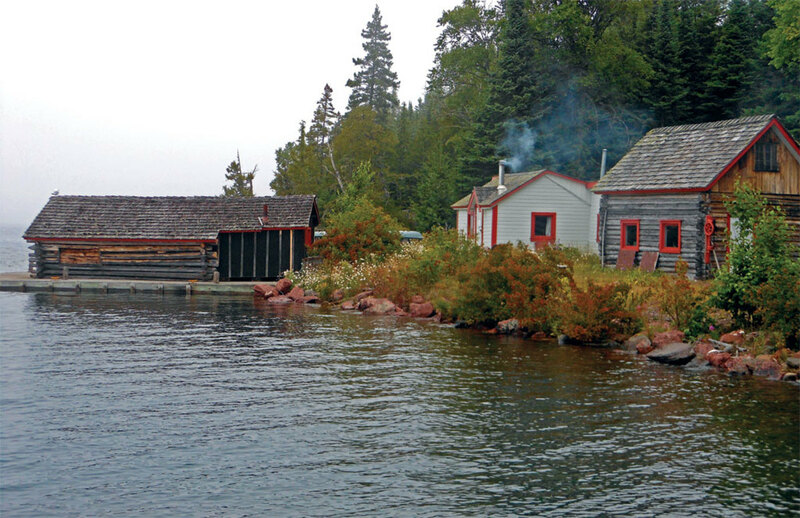 How remote is Isle Royale? In two weeks on the island, we saw just three other boats. And, yes, it has plenty of moose. 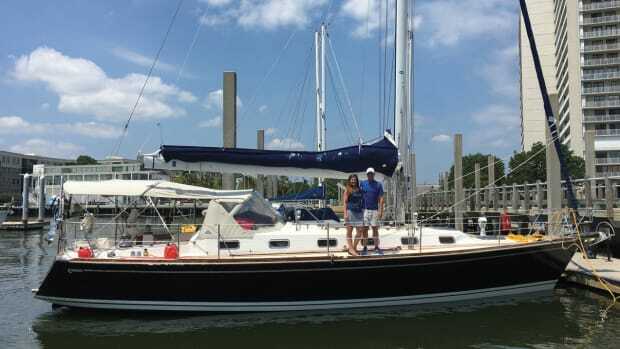 Fred and Jennifer Bagley live in Vermont but keep their boat in Northern Michigan and spend their summers exploring the Upper Great Lakes.